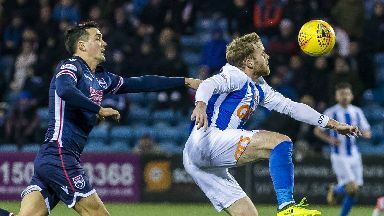 The midfielder was dismissed before Kilmarnock converted the winning penalty. The red card shown to Ross County midfielder Tim Chow in the closing stages of their Scottish Cup defeat to Kilmarnock has been rescinded. He was sent off by referee Bobby Madden in the 88th minute for denying a goal scoring opportunity when Rory McKenzie hit the deck. Lee Erwin converted the spot kick which sealed the 1-0 victory, despite Ross County's efforts to force a replay. Goalkeeper Aaron McCarey had a header cleared off the line four minutes into stoppage time. The Scottish FA's fast-track decision to drop the suspension means he will now be available when they enter the competition again next season. The Highlanders take on Rangers in the Scottish Premiership at home on Sunday in a fixture that is now sold out.